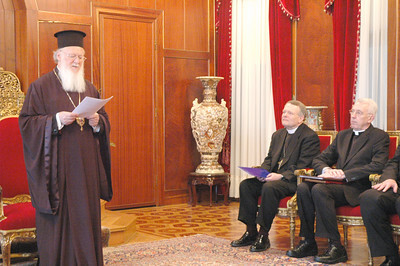 His All Holiness Ecumenical Patriarch Bartholomew, world Orthodox Church leader, addressed the ELCA delegation in Istanbul March 17, 2006. Seated are, from left, the Rev. E. Roy Riley Jr., bishop of the ELCA New Jersey Synod and chair of the ELCA Conference of Bishops; and the Rev. Lowell G. Almen, ELCA secretary. Almen and Riley were delegation leaders. The Rev. 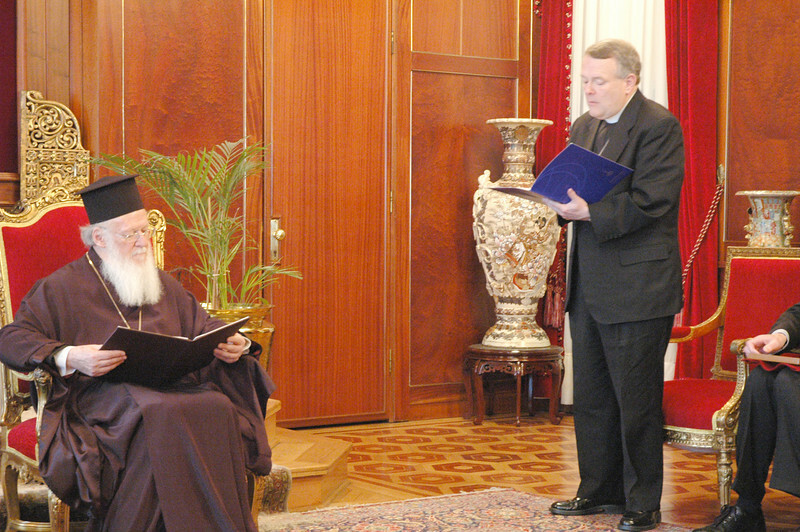 E. Roy Riley Jr., standing, bishop of the ELCA New Jersey Synod and chair of the ELCA Conference of Bishops, reads a formal greeting from the ELCA to His All Holiness Ecumenical Patriarch Bartholomew, seated, during a March 17 meeting in Istanbul. The ELCA delegation toured St. Peter's Basilica in Vatican City, and met with several Vatican leaders there during the delegation's visit March 20-24. 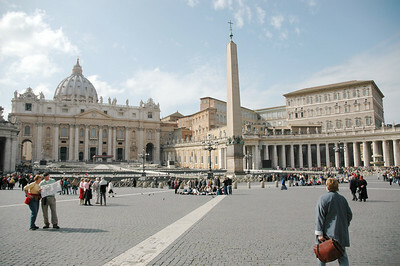 It is the world's largest cathedral. 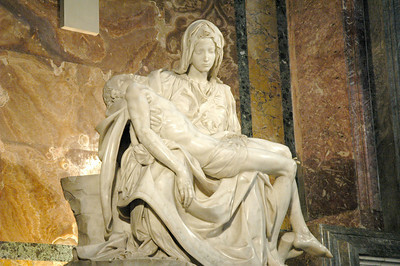 Participants on the ELCA Ecumenical Journey got an up-close look Michelangelo's "Pieta'" which is on display in a restricted area inside St. Peter's Basilica in Vatican City. The Rev. Lowell G. Almen, left, ELCA secretary, addresses a question to Cardinal Walter Kasper, president of the Pontifical Council for the Promotion of Christian Unity, at The Vatican March 21. 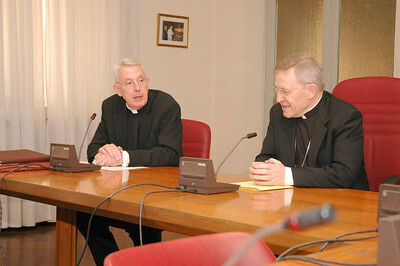 The ELCA delegation visited several Vatican leaders during its 5-day visit to Rome. 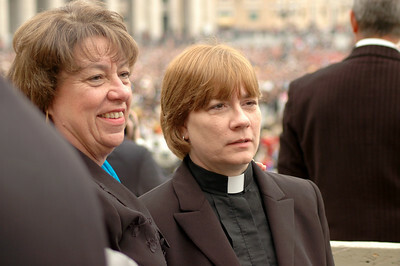 Faith A. Ashton, left, a member of the ELCA Church Council, Chapel Hill, N.C., and the Rev. Martha W. Clementson, assistant to the bishop, ELCA Southwestern Pennsylvania Synod, Pittsburgh, were two members of the ELCA delegation who were part of the ELCA Ecumenical Journey. An icon of St. Augustine was presented to Pope Benedict XVI by the ELCA delegation after the pope's March 22 public audience in St. Peter's Square. The icon was made specifically for the pope by the Rev. 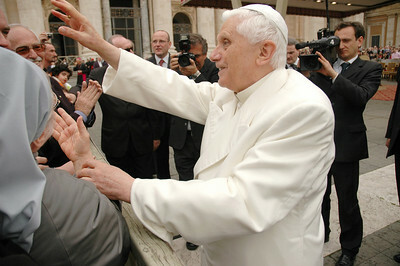 Gary L. Safrit, retired ELCA pastor, Greer, S.C.
Pope Benedict XVI, center, greeted several members of an ELCA delegation following his public audience at St. Peter's Basilica March 22 in Vatican City. With the pope, are, left, Bishop E. Roy Riley of the ELCA New Jersey Synod and chair of the ELCA Conference of Bishops; second from right, Bishop Philip L. Hougen, ELCA Southeastern Iowa Synod; and right, Bishop Steven L. Ullestad, ELCA Northeastern Iowa Synod. 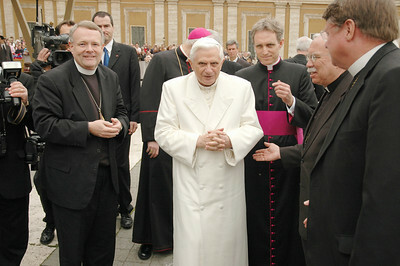 Pope Benedict XVI greeted an ELCA delegation and others who attended his weekly public audience in St. Peter's Square March 22 in Vatican City.